Credit Card Processing Services (CCPS) strongly believes that honesty is the best policy. We are pleased to be able to communicate this to our merchants and prospective merchants in writing. 1. Credit Card Processing Services, Inc. is a registered ISO/MSP of HSBC Bank USA National Association, Buffalo, NY and we strictly follow the rules and regulations of this fine organization as well as those of MasterCard and Visa. 2. Credit Card Processing Services does not post teaser rates on our website, as other companies do. We want our merchant to know that the interchange rules established by MasterCard and Visa are extremely complicated and are composed over 100 pages of rate categories. CCPS gives all of our merchants the option of signing up for a tiered program such as qualified, mid-qualified, and non-qualified or an interchange plus rate structure. Although interchange plus is more complicated to understand and explain we want you to know that in most cases this is your lowest cost option. We would be happy to explain it to you if you give us the time. 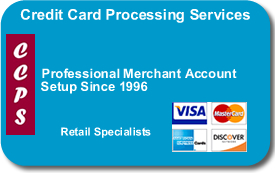 3. Credit Card Processing Services does not lease terminals or other equipment and has not done so since around 1996. Although other companies in the business believe in leasing we do not. We think that leasing is rarely the best or most cost effective way for a merchant to obtain equipment and we do not feel good knowing that a merchant who signs a lease typically enters a non-cancelable agreement usually lasting for four years and costing thousands of dollars. We believe that a free terminal placement, month to month rental, free reprogram of existing equipment, or a low cost equipment purchase are always your best options. 4. What does FREE mean in our free terminal placement program offerings? It means that for every one of our merchants who signs up for this program and is approved our processing partner will ship at no cost to our merchant the equipment promised. Our merchant can then use this equipment for as long as they continue to process with our processing partner. We will fully support the equipment and will replace it up to twice per year at no cost should it malfunction and cannot be easily fixed over the phone. At any point in time our merchant is welcome to return the equipment and we will even send a call tag or return label so there is no cost of returning the equipment. 5. We provide to our merchants the full and complete terms and conditions of their merchant agreement. This is required by MasterCard and Visa, our sponsoring bank, and federal law. So always make sure that you receive this important paperwork. Whether you sign up with us or another company it is your legal right and our obligation to get you a copy of what you signed. Because the fine print on the terms and conditions doesn’t fax very well we are happy to provide them here on our website for you to print yourself. In addition, you are sent a complete copy of all of your paperwork in your welcome package that is sent to you via FedEx. 6. CCPS is confident that the service that we will provide your business is personal, professional, and very competitively priced. We are thrilled that Credit Card Processing Services has a very low attrition rate which we credit to our honest low cost upfront pricing and attentive personal service after the sale. Over the past decade plus we are proud to have had the opportunity to be able to assist several thousand businesses, both existing and new, setup their merchant accounts.